Here’s an idea: can you radically reform an entire workforce that in the UK numbers half a million people, roughly six times that in the US and however many globally? Would you even attempt it? Turns out you would if you’re an education reformer infuriated by teachers. Teachers, to an extent, still hold the keys to the classroom. As such, they are consistently singled out as one of the biggest barriers to techno-reform efforts. Technophobic, lacking skills and just plain too old, say reformers. A 'reckless and dangerous' risk aversion to technology, according to the UK government’s advisory group on digital learning, is creating a 'powerful barrier to progress'. 'Teacher (un)sophistication,' says one US investor, is among the biggest systemic risks to the industry. So, if you're an edtech-er and teachers are standing in your way, how would you go about the Herculean task? Liz Anderson, Google for Education's head of 'global adoption programmes’ speaking at the 2015 Global Education Symposium, 'Google's main thought leadership event' on education. 'The practice of teaching is actually incredibly complex,’ she added, which won't surprise any teachers, 'and famously resistant to change'. Undeterred, reformers seem to have come up with some staggeringly ambitious ideas for getting what they want: a school workforce that embraces, or at least doesn’t actively oppose, their reforms. It goes something like this (possibly). If there is one part of the education system that reformers appear to openly loathe, it is teacher training colleges (or ‘Enemies Of Promise’ as Michael Gove called the people running them). From a commercial edtech perspective, teacher colleges’ ‘negative attitude' to technology is seen as one of three big systemic risks to the for-profit education industry. No surprise Microsoft and interactive whiteboard firm, Promethean, have both called for a ‘reinvention’ of teacher education. ‘Seats of resistance’ (as opposed to 'agents of change’) is UK-based edtech-champions GELP’s take on the 'monopoly providers' (universities, mainly) that currently have a ‘deadening grip’ on initial teacher training. They haven’t, but reforms have been introduced that have sought to downgrade university courses in favour of school-based training. In the UK this has seen a network of teaching schools and alliances set up to train the next generation. Part of their job, according to then Education Secretary Gove, is to ‘help other schools develop and improve their use of technology’. A 2015 RSA report supported by Google fleshes this out: teaching schools should partner up with ‘tech specialists’ (and experts in pedagogy), it says, and ‘lead the way in developing a model of learning through digital technologies’. Add to this the high profile, fast-track training programme known as Teach First in the UK, Teach for America in the US, and the global network, Teach for All. Crudely, it takes bright, young graduates, gives them a crash course in teaching and sends them into classrooms for a couple of years before they move on to other careers (40% are gone after two years, 60% by year five). It's a reformer's dream. These new teachers enter schools trained to handle the demands of a data-driven education system (and are relatively untroubled by educational theory). In the US at least, the programme also appears to open the door to more tech use in schools, with its head of edtech described as ‘strategising daily’ with edtech sellers. On top of this, many of its alumni have gone into education reform roles, including at tech firms, fulfilling the programme’s desire to create a 'movement' of people able to influence at a system-level. Political and corporate support for the programme has been generous. Donors include Google, investment giants like Blackrock, global banks and the Big 4 accountancy firms. Among the programme’s advisors are edtech investors, a recent chief lobbyist of Intel, a Pearson director, and the head of McKinsey’s global education practice. A decade ago, edtech investor Michael Moe noted that the impending ‘teacher retirement bubble’ in the US would lead to positive changes in the system. It would, he predicted, mean the arrival of a younger, ‘more tech-savvy’ teacher base. They've arrived. What to do, though, with the remaining teachers? Forcing reform on them doesn't work. ‘Command and control’ tactics by government only lead to ‘surface compliance’, says GELP. Worse than that, efforts to impose change are ‘fraught with risk’ and can result in ‘union unrest’, ‘political opposition’ and ‘negative media campaigns’. Which means that teachers, once seen as the block to reform, are now the solution! Google is among those now energetically wooing teachers. Its 'It Takes a Teacher' campaign, launched on World Teachers’ Day 2016 and culminating in a virtual, global conference for teachers, celebrates 'the real star of any great classroom: great teachers'. That last tweet probably gets closest to the point of the campaign: pushing Chromebooks, Google’s classroom device, and education products into schools (while celebrating teachers). There are now 70 million users around the world of its 'G Suite for Education' tools. Particularly, as previously noted, when it comes to the adoption of technology in classrooms. Which is why teachers are also being recruited to sell edtech to their peers. Each tech giant has created its own corp of tooled-up teachers. Microsoft has invested in a band of ‘Innovative Educators’; Apple's are ‘Distinguished Educators’; Adobe has created ‘Education Leaders’; Toshiba, ‘Ambassadors’; Intel's are ‘Visionaries’; Discovery Education has its ‘Gurus’; Oracle's are, what... ‘Oracles’? Google's ‘Certified Innovator’ teachers are trained in using Google edtech products at Google’s Education Innovation Academy. From then on, though, they are Google’s ‘ambassadors for change’, each with a plan for how they will grow ‘as thought leaders’, make an impact in their communities and spread the word through personal networks, blogs and social media. The US, Australia, Sweden, Brazil and the UK are all playing host to the Google Academy in 2017. Apple's team of Distinguished Educators, or 'ambassadors of innovation', are similarly encouraged to 'share their expertise with other educators and policy makers'; 'author original content about their work'; and 'advocate the use of Apple products'. 'Innovative Educator Experts’ work 'hand-in-hand with Microsoft' to 'advocate for the effective use of technology in the classroom'; 'share ideas with peers', and 'become thought leaders in the edtech space'. The tech companies describe these programmes as professional development, but they come across as peer-to-peer marketing campaigns. They are creating teacher-cheerleaders for edtech. Teachers listen to other teachers. As a recent New York Times piece reveals, the tech giants aren't alone in recruiting 'teacher influencers'. Edtech start-ups are also enlisting them as brand ambassadors, but in this case in exchange for perks ranging from t-shirts to free tech and conference trips (the tech giants told the NYT they only pay minimal expenses). As the article notes, there are striking similarities between these strategies and those used by the pharmaceutical industry to cultivate doctors to influence their peers. Like 'teacher influencers', another role being championed by reformers is that of the ‘teacherpreneur’, defined as a coming together of innovative classroom teacher and risk-taking entrepreneur. Feted in the press and celebrated at reform conferences – often they are the only ones on the platform who have been near a classroom – they have a profile beyond their impact. Many are teachers who have made the leap into edtech (alone, or with corporate backing). Many – most, perhaps – are motivated by a desire to help their pupils learn. Few make money, or even set out to make money. Even if they do, who would begrudge a teacher a second income. They are, however, part of a shift that is happening, largely driven by reformers, which is all about redefining the role, and shifting the expectations and mindset, of teachers. For all the appearance of a bottom-up reform movement – with its change-makers, game-changers, ambassadors, innovators and entrepreneurs – this is largely being done to the profession. 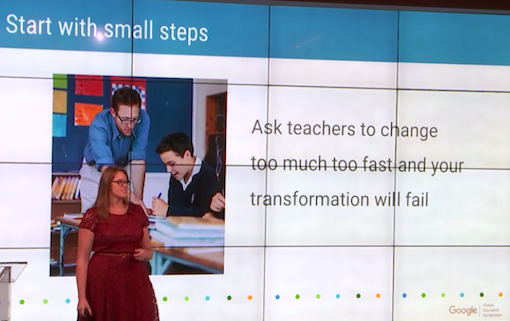 'We’re asking them to completely rethink their role in the classroom,' says Google's Liz Anderson in a presentation on using professional development programmes to 'transform teaching careers'. 'The role of teachers, their identity as teachers, their relationships with students and learning, their working and learning habits, all have to change fundamentally,' echoes the Cisco/Promethean/Gates Foundation-sponsored GELP. Teachers need not fear, however. The future painted by reformers (often men) is a land of opportunity, where educators are released from drudgery, creatively fulfilled and able to devote their time to what teachers (often women) are really good at, which is relationships. The free-market think tank Reform, for example, talks of technology 'augmenting teaching roles', with automation freeing educators 'to focus on the high-impact, more creative and inter-personal parts of their job'. But, while many of the routine tasks of teachers will be outsourced to technology ('that's going to happen,' says Schleicher), 'let's not make this a story of job losses,' Schleicher cautions. To at least some of the world's education ministers in his audience, though, that's precisely what it's about. Instead, the reform story needs to be told in a way that teachers welcome their changed circumstances. But, really, authentically welcome it. For edtech to progress, say the UK government's edtech advisory group, the mantra "try something new" must be 'embraced (joyfully!) by all'. Only if teachers are really engaged and motivated – meaning enthusiastic, interested and long-term committed – will technology be successfully used in classrooms, says the 2015 RSA/Google report. Here's a snapshot of the future teachers are being asked to (joyfully!) embrace. It's widely imagined that the job of teaching will be ‘sliced up’ with the 'delivery' bit of education to a greater or lesser extent being done via technology. Ideally, teachers will keep some central role as the ‘learning designer’, the ‘mentor at the centre’, or the ‘activator' of learning. GELP has imagined some new roles that might also emerge: ‘internship coordinator’, ‘project work facilitator’, ‘blended learning program director’, or ‘game-based learning teaching faculty’. Not to be outdone, US-based reformers, KnowledgeWorks (another Gates Foundation-funded operation) came up with its own list of future educator roles: 'Learning Pathway Designer', 'Competency Tracker', 'Pop-Up Reality Producer' (I'm not making this up: that job involves 'producing pervasive learning extravaganzas that engage learners in flow states'); 'Social Innovation Portfolio Director'; 'Learning Naturalist'; 'Micro-Credential Analyst'; and 'Data Steward'. Future systems will also have ‘master’, or celebrity teachers who, because of their expertise, will be beamed virtually into classrooms around the world. The prototype is Sal Khan, former hedge fund analyst and founder of the hugely popular online tutorial site, the Khan Academy. Google’s Eric Schmidt, Bill Gates and other influential reformers are big fans. Eric Schmidt (left) to Sal Khan: 'I think 50 years from now, people will say you were the most effective and greatest educator on the planet'. Thanks to the erasure of physical barriers through digital learning, these ‘teachers of record’ will be allowed to instruct in multiple schools at the same time, according to US lobby group, Digital Learning Now (which is advised by Gates Foundation, Google, Microsoft, Apple, Pearson, Intel and the rest). In the lower ranks, others who ‘take part in the learning process’, as reformers Chubb and Moe put it in their book Liberating Learning, may work with ‘much larger’ classes in computer labs, with pupils online (in real time, or not), and with parents who oversee their child’s virtual, home-based learning. This is the future on offer to teachers. Maybe they are right to resist. Maybe it’s not teacher ‘(un)sophistication’, their lack of appetite for risk, or age that is the barrier to technology adoption in schools. Maybe it's the lack of credible evidence that technology raises standards. Or, that it saves teachers time. Or, because edtech firms rarely bother to consult with the teachers over what they need in the classroom. Betsy Corcoran, publisher of the edtech bible, EdSurge, has described edtech as ‘the most broken marketplace’ ever ‘with a wide chasm between people developing edtech and those using it’. Perhaps it's because edtech-ers seem to have only a passing understanding of what it means to teach and talk solely in buzzwords. Maybe we should be thankful that teachers are a barrier to reform. They're about the only thing standing in the way of the ambitions of the commercial edtech industry.